All right, whenever you click on a tool that allows you to have colors/fills you'll see the menu pop up below it and it will have a button with color in it. If you click on that button a palette will show up with different colors in it. The tools that allow you to color are: Pencil, Text, Brush, Ink Bottle, & Paint Bucket. You can either use the predefined colors or make your own. To make your own fills you need to click the button at the bottom of the palette (circled in red in the picture to the left). Another box will come up with two tabs at the top listing Solid & Gradient. Here is a picture below with the Solid Tab selected. The gradient one pretty much looks the same. 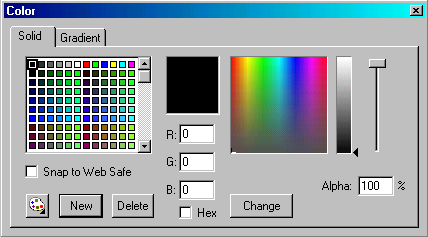 You have the ability to delete fills (just select the color on the palette to be deleted and press 'Delete'), make new fills (edit your new color and press 'New'), or Change current colors. Solid colors are easy to manipulate. We will talk about gradients in the remaining part of the article. 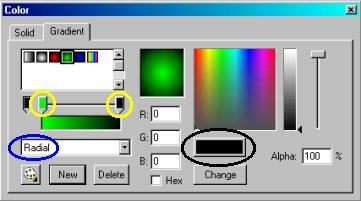 Draw a circle, go to the Paint bucket to fill it and select to edit the gradients (red circled button in diagram at the top of this page). Following the diagram below, make sure your drop down box says 'Radial' (for circles) and not 'Linear' (lines) (circled in blue on the picture below). You can change the color of your sphere by clicking on the first arrow marker (circled in yellow on the picture), and changing the color by clicking the color palette and editing to the and fill it. Make sure to delete the line out side the fill when you’re through. Only PRACTICE is the key to success. Play with the colors of your fills, and see how they work.